Excitement is in the air. Dreams and hopes about what is to come. Questioning yourself if you know enough and how much you will learn. Will they all be nice? Will it be heavy work? Will I find my place there? When all these questions arise you know it is about to happen – the intern life at Lindegaard, with Bent and Kathrin. I was so happy the day I arrived at Lindegaard. The adventure was about to start. Now I am closing in on the end of my internship and I am still so happy to be here. Yes, it it is hard work, and sometimes you wonder how it can already be morning when the alarm is buzzing but to be in the intern bubble and only live, train, breathe and love horses is truly amazing. A typical intern day you start working just before 6; feeding, mucking, sweeping, brushing horses and taking them to their fields. Then there are lessons for weeks students and interns and then Bent is training his horses. After this there is lunch feeding and a few hours break. In the afternoon Kathrin is giving lessons and training her horses and you are of course welcome to watch if you want to, but this is not part of our working day. You can also just hang out with your new best friend, your bed. In the evening we muck, sweep and feed the horses and are usually ready around 19.30. During the weekends there is less work so there is definitely time to relax and get some extra sleep. Every week you get three lessons with Bent. I remember how nervous I was when showing my horses to Bent. When you stand there in the arena and everyone is watching you and your horse. 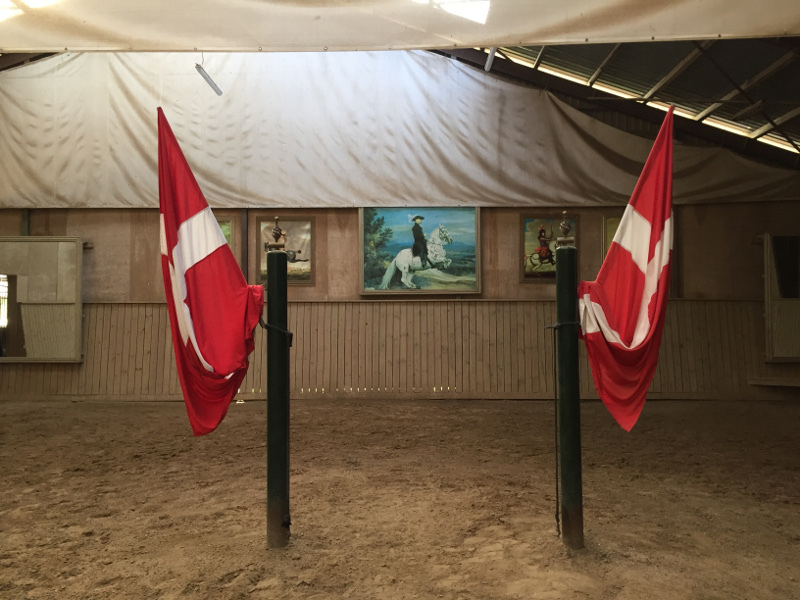 The thing is both Bent and Kathrin are really nice, so the nervousness quickly disappears and then you can just focus on learning, as much as you can possibly get into your and you horse’s heads and bodies. I have learnt so much during my lessons, details I didn’t even know existed. I have focused a lot on my seat, but the beauty is that no matter your level, you will get a very good education! You will start where you need to start, to get a thorough understanding of how to train horses, whether it is in ground work, longeing, hand work or riding. And then I have not even mentioned all the other wonderful people you meet when being an intern… Of course you work close together with the other intern. Every week there will also be week students training for Bent and/or Kathrin. You live together with the week students so there is plenty of time to discuss horses, academic art of riding, horse tack, life,…, you name it. There are also other guests visiting, like people coming to see Bents´s training, trainers, saddle makers etc. This is a truly inspiring and a huge part of why I am so happy about being here. I can just totally indulge in the academic art of riding and everyone else is just as nerdy about it as I am! The side movements, shoulder in and quarter in. Used a lot in the academic art of riding, but how do we really ride them, or maybe rephrased, how do we ride them from our seat? The side movements, shoulder in and quarter in (and the counter shoulder and quarter in) are movements we use a lot in the academic art of riding. They are also quite misunderstood, in the sense that people focus on the “side” of the side movements. They should not be more sidewards than forwards. When you focus too much on the sidewards the horse often straighten up and fall on a shoulder or step too much out or in with a hindleg. The side movements are to be used to send all four legs of the horse in the direction of the movement, the hindlegs stepping in under the seat of the rider and the front legs stepping in under the muzzle of the horse. This can most easily be seen when looking at the hooves of the horse. Are they all moving in the same direction or is the direction of some hoof twisted in or out? Horse and rider are seen from behind. 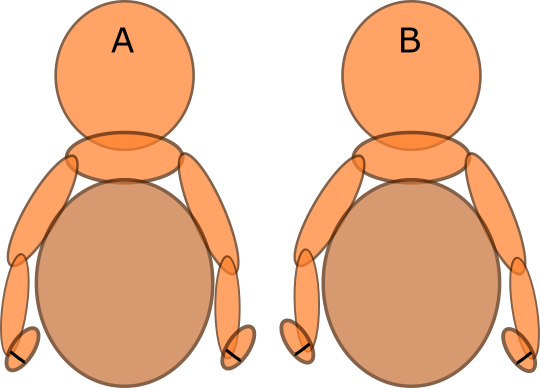 Rider A is doing a shoulder in to the right and rider B is doing a quarter in to the right. As we discussed in the last blog post, the upper legs of the rider should lie flat against the saddle. The front muscles of the thighs move the shoulders of the horse and the back of the thighs move the hindlegs of the horse. To do a shoulder in you use the front of the outer upper leg (heel out) to move the shoulder in and the back of the inner upper leg (heel in) to move the hindlegs out. For the quarter in, you use the back of the outer upper leg (heel in) to move the quarters in and the front of the inner upper leg (heel out) to move the shoulders out. Sounds like a lot of details? Bent had the perfect picture to remember this. Think that you are having skis on your feet. They should always stay parallel to each other. The inside upper leg is always working in a downwards sense and the outside one in an upwards sense. …when you have learned all the “technical” details you also need to develop your feeling of the horse and the movements. In addition to having your upper legs in order you also need to think about your direction of movement and balance. The forward shoulder in has the direction to the outer shoulder whereas the collected shoulder in has the direction towards the tail. The forward quarter in has the direction of the inner shoulder whereas the collected quarter in has a direction towards the inner hindleg. Last but not least, when you have learned all the “technical” details you also need to develop your feeling of the horse and the movements. In the end you need both to obtain harmony. Riding with the seat – what is the seat? Ride your horse with the seat. Who never heard this phrase when riding? Easily said but harder to actually do. Some time ago I write a blog post about “the onion”, that you go deeper and deeper into details when learning something, like peeling the layers of the onion. Bent and Kathrin have helped me to peel a lot of layers of the seat onion lately, but I am also sure there are many more layers to discover in the future. I look forward to my journey! When we talk about the seat we mean from knee to knee, ie pelvis and upper legs. An important thing many of us forget when talking about the seat is the direction of movement, or balance. The first step of developing your seat is to find your balance, to stay up on the horse without having to hold on with either hands or legs. When this can be done you can start following the horse’s movement and then you can start to influence the movements of the horse. Your balance and your pelvis is the true primary aid. You can never stop using them. Upper legs are something in between primary and secondary aids. They belong to the seat and are therefore a primary aid, but you can stop using them, thus a secondary aid. The upper legs are to hang straight down, relaxed in the hip joints. To be able to feel what the horse is doing under you, and to influence the movements, you need the flat inside of your upper legs to lie against the saddle. If you then turn your heel out the front of the upper leg will move closer to the horse whereas if you move your toes out the back of the upper legs will move closer to the horse. We are using the front and back of the upper legs to direct the movements of the horse. The front of the upper legs will direct the chest (and hence shoulders) and the back of the upper legs will direct the hind legs of the horse. The inside upper leg is working in a downward direction whereas the outside upper leg works in an upward direction. Usage of the legs when riding, as seen from behind horse and rider. In A the rider is neutral whereas in B the left leg of the rider has been turned so that the heel is pointing outwards and the front of the upper leg moves closer to the horse and take influence of the left shoulder. In C the left leg of the rider has been turned so the toes are pointing outwards and the back of the upper leg is moving closer to the horse to influence the left hindleg.